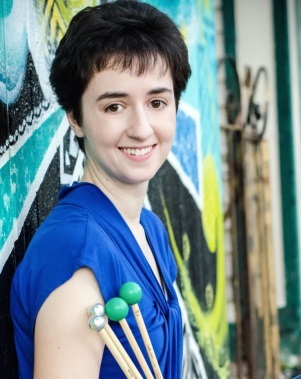 Percussionist Colleen Bernstein is a versatile musician, pursuing her passions as both an ambitious performer of contemporary music and an enthusiastic arts educator. She was awarded the Ludwig Albert Talent Prize at the 2015 Universal Marimba Competition, held in Belgium, and she performed with the inaugural All-Star Percussion Ensemble at the 2015 PAS International Convention in Texas. Most recently, Colleen performed as a duo with Béla Fleck in February and March 2016. Currently, Colleen curates a series of educational programs celebrating contemporary music in collaboration with The Strong National Museum of Play in Rochester, NY. She also works with Marimba Productions Incorporated on the Keyboard Percussion Pedagogy Initiative. Colleen is pursuing a degree in Applied Percussion and Music Education, as well as the Arts Leadership Certificate, from the Eastman School of Music. There, she studies primarily with Michael Burritt and performs regularly with the Eastman Philharmonia, Wind Ensemble, New Jazz Ensemble, Percussion Ensemble, and OSSIA New Music.